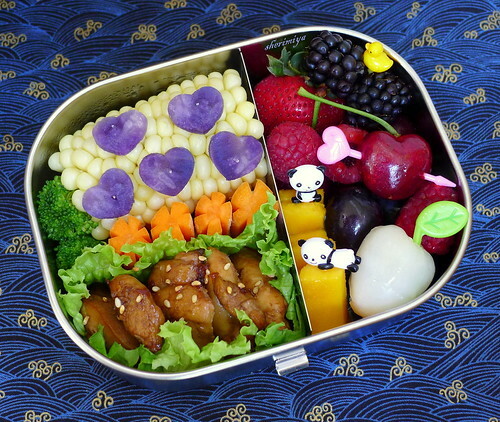 Colorful Bento Of Hearts, a photo by sherimiya ♥ on Flickr. This is a bento I made for MisterMan. It contains shoyu chicken in a lettuce cup, carved carrots, steamed broccoli, corn on the cob, and Okinawan sweet potato heart cutouts. I anchored the purple hearts with rice sticks stuck into the corn. The fruit side has a selection of strawberry, blackberries, raspberries, cherries, mango and lychee. All the delicious fruit of summer! And since I'm still on the stainless steel kick, I've packed everything in this cool latched divided lunchbox (one of my favorites). All the foods I've used are ones that taste good cool or at room temp, making it a refreshing midday meal on a warm day. I like the way the metal stays cool in his insulated tote, keeping the food inside crisp and appetizing. This bento includes all the colors of the rainbow, with a balanced variety of protein and vegetation. It's an easy feat with the rich bounty of summer; have you packed a rainbow in your bento lately? Me too Lia. It's the simplest, and it's good for kids to get used to eating room temp. Heh! wow.. colorful and yummy bento as usual and it's true: It has rainbow's color. I always love your bento, sheri! This bento is amazing. I love it. I try to put a rainbow in my daughter's obento for her Japanese youchien, as much as I can! Do Okinawan sweet potatoes freeze well? Hubby has to go to Okinawa next month and can bring me back some, if it can freeze! I do love all those colors, but have to ask...what are you using for your backgrounds? Fabric, scrapbook paper, something else? Erin H., that's great! I personally haven't frozen Okinawan sweet potatoes, but I think others have done so successfully. 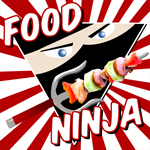 If it's the only way you can get to try some, I'd say go for it! Jenn, my bento boxes are on the larger side, so the usual 12x12 scrapbook paper is usually too small. Most often I use fabric; I have a large stash of beautiful Asian fabric since I also sew on the side :) Thanks! Very healthy and I like talepanda toothpick (or how you call it... was it "pick"? Forgot..). So cute! Your bentos always make me so happy. They are just lovely. I haven't made any bento this summer but I am always inspired when I see yours. Yes, I love the panda picks too. Thanks Nami! Thanks Kim, your comment is so sweet. Appreciate it!